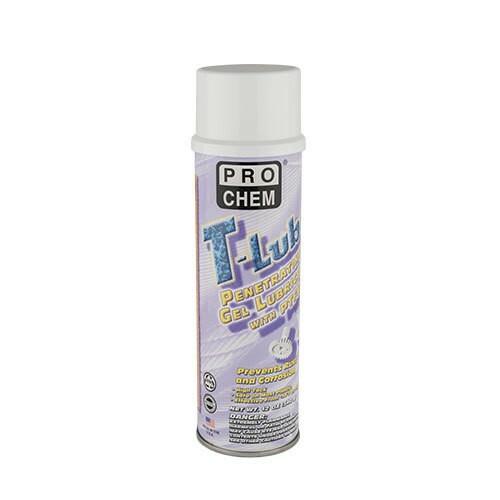 T-Lube | Pro Chem, Inc.
T-LUBE is a high tack lubricating gel that provides lubrication at temperatures from –30°F to +500°F. Penetrates as an oil to lubrication point, then forms into a tacky, grease-like gel. Contains a fine PTFE and gel lubricant mixture which helps provide superior wear and lubrication deep inside working parts. Resists water washout and weathering. Prevents rust and corrosion and covers parts with a moisture-resistant barrier. This product is suitable for use as a lubricant where there is no possibility of food contact in food processing and food handling establishments. For use by machine shops, HVAC and plumbing operations, automotive, manufacturing, food processing plants. SHAKE WELL BEFORE USING. Remove cap and rotate actuator until orifice is pointed toward mark on valve cup. Spray holding can 12 to 14 inches away from surface to be treated. For hard to reach areas, insert extension tube into actuator orifice.